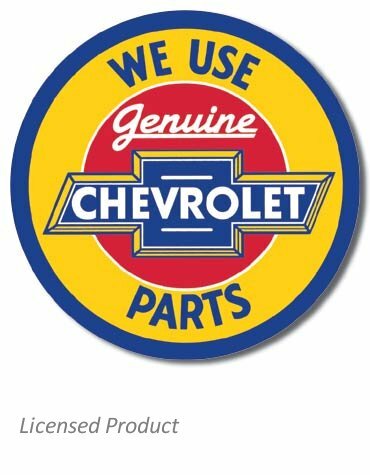 Chevy fans will love this licensed reproduction of the old "We Use Genuine Chevy Parts" metal sign. These types of signs were usually found at an authorized Chevy dealer parts department. A great decoration piece for the Chevy fan garage, office or man cave. Or a great gift for any American automotive nostalgia collector or gearhead. This is a metal sign, made in the U.S.A. Measures 11.75 inches round. UPC: 6-05279-11072-8 | Part No. 1072. Ask a question about "We Use Genuine Chevrolet Parts" Tin Sign.